Natchitoches Parish Clerk of Court David Stamey spoke to the Walter Ledet Coffee Club Wednesday morning about the Oct. 14 state election and particularly on the school board tax. The school board is asking for a seven mill, 20-year property tax for $18.6 million to basically renovate buildings in the Natchitoches High School system. The tax will be assessed for all of school district # 9. Stamey said he spoke earlier with Parish Tax Assessor Dolly Mahoney who outlined the monetary effect the tax will have annually on homeowners tax bill. A house, assessed at $100,000 less the $75,000 homestead exemption would increase the tax bill by about $17.50 a year. For a $200,000 assessed home, the increase would be about $87.50 a year. For a $300,000 assessed home, the increase would be about $157 a year. The taxes would increase proportionality as the value of the home increases. Stamey pointed out that these estimates are based on today’s assessments and every four years property values are reassessed; so, after eight years and two reassessments the tax increase could be significant. 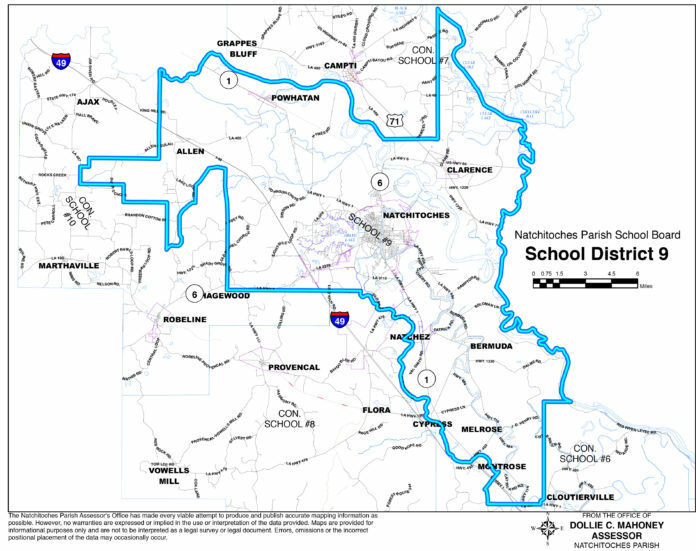 School District # 9 includes all of the city, Oak Grove and surrounding areas. Stamey said back in the 1930s when the high school was built, students from Clarence, Powhattan, Cane River and the surrounding area were sent to the school, which is now Louisiana School Math, Science and the Arts building. The area where the students lived formed the taxing area for District # 9. Concerning the constitutional amendments, Stamey said since 1974 when the last state constitutional was written, the constitution has been amended 186 times. Of that number, 92 of the amendments dealt with the budget or financial matters. Needless to say another constitutional convention needs to be held. On the upcoming ballot, Amendment #1 deals with prorating annual property tax on the percentage of the industrial site completed rather than taxing the full amount the first year of a multiple-year project. Amendment #2 deals with the surviving spouse of volunteer firefighters killed in a crisis not to have to pay property taxes on the home as long as he or she does not remarry. Amendment #3 deals with restricting fuel taxes to only that being used in the line of work and not for wages. Stamey also provided voting precinct and condition updates at a commissioner school at the Events Center Oct. 3. All precincts will vote on State Treasurer and the three amendments to the State Constitution. Those casting ballots at precincts 4-4, 4-5 and 4-7 and some voters in 4-3 (Melrose) and some in 4-9 will vote on the Fire District 1 item. The two precincts formerly located at the Magnet School on University Parkway, 1-4 and 1-4A, will now vote at the NCHS boys gym. The precinct formerly located at Llamb’s Heating and Air, 4-9, will now be at the Christian Worship Center at 1513 Hwy 494. The precinct formerly located at the Marthaville Heritage building will be at Marthaville First Baptist Church Activity Building, 10660 La. Hwy 120. The following precinct changes are temporary. They will resume their previous locations in 2018. The changes were made due to conflicts with events at these locations. Melrose-St. Augustine Catholic Church precinct will be moved to the Cypress Police Jury building for the October and November elections. All precincts will vote in November if there is a runoff in the State Treasurer’s race. A breakdown on proposed renovations/improvements. The Sales Tax Dist. 9 (different from school board district 6) proposition, will focus on renovations and new construction to M.R. Weaver, East, Natchitoches Magnet, Frankie Ray Jackson, NSU E-Lab and Middle Lab, L.P. Vaughn and Natchitoches Jr. High. The proposition will fund $18,000,000 in 20-year general obligation bonds for school improvements. • Major Mechanical, Electrical and Communication Systems are approaching 20 years old at all schools and need major upgrades. • Major upgrades to restrooms, kitchens and other support facilities. • Security fencing and camera systems at each campus should be updated. • Outdoor activity spaces at most campuses are in need of repair or replacement. • The cost of campus and building repairs exceeds normal maintenance funding. • Natchitoches Jr. High has inadequate restrooms, gymnasium bleachers in need of replacement, a worn out parking lot and track, and no restroom or concessions facility for the public at the football field. • Natchitoches Central High School is overcrowded and in need of additional classroom space. • NCHS has outgrown the old fieldhouse and has no grandstand and restroom/concessions facility for the public at the football field. • Energy and maintenance savings. • Modernization, energy efficiency, necessary repairs and upgrades, security and savings in maintenance costs.